Realtors should remain in touch with their prospective clients and regular clients, if they really expect a skyrocket their brand values. Trust is a big factor for any real estate agency given to its highly competitive nature and it requires continues efforts to find success. 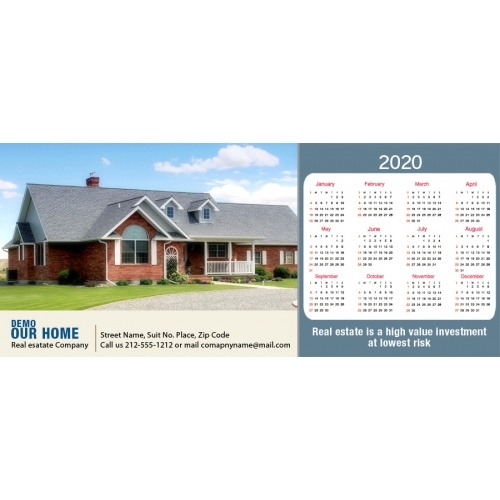 Promotional 3x7 square corner real estate calendar magnets can be sought by residential and commercial property realtors, real estate agents, construction houses, land developers, local property listings, etc. Personalized 3x7 square corners real estate calendar magnets can be handed over during property expos, tradeshows, and property developer’s seminars or after a service, etc. Custom 3x7 square corners real estate calendar magnets are retained in many homes because it fuels an onlookers dream to buy or sell a house/property, etc. Product Size : 3 in. x 7 in.